Nowadays, growing interest in the possibility of prophylactic and therapeutic use of plant products rich in biologically active compounds has been observed. Among them, special interest has been focused on polyphenol-rich products. Owing to the multidirectional favourable action of polyphenols, products rich in these compounds are recommended as functional food in the case of civilization diseases. Moreover, data from studies in animal models show that polyphenols may be a promising preventive/therapeutic strategy for xenobiotics, including toxic heavy metals. The protective impact of polyphenols against metal toxicity may be explained by the presence of many hydroxyl groups in the structure of these compounds, which are capable of forming complexes with metals preventing as a result from their gastrointestinal absorption and accelerating their elimination from the body with urine. However, it should be taken into account that polyphenols may bind not only ions of toxic metals, but also bioelements, what makes a risk of their shortage in the organism. 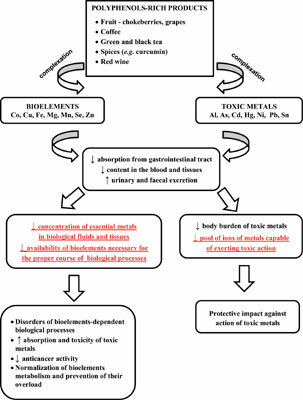 This review provides an overview of implications for humans’ and animals’ health of complexation of bioelements and toxic metals by polyphenols present in the popular foodstuffs, including phenolic acids, cyanidin derivatives, delphinidin, quercetin, kaempferol, morin, epigallocatechin-3-gallate, and curcumin. Polyphenolic compounds capable of binding both necessary and toxic metals occur in commonly consumed products such as green tea, and some fruit and vegetables, including chokeberries, bilberries, and black currant fruit, grapes, and apples, as well as onion. The mechanisms of complexation of essential and toxic metals by polyphenols and possible implications of these for health are discussed. Bioelements, complexation, health implications, interactions, polyphenols, toxic metals, plant extracts, protection.